The bump on top of the big toe joint is not a bunion, it is most likely a bone spur. Like all bone spurs, this spur comes from excessive pressure along the bone. 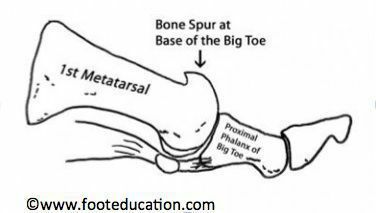 In this case, there is excessive pressure along the big toe joint when it moves. The bone will lay down calcium to protect the bone. As the bone spurs grows, there will be less movement in the joint. The joint itself will break down and this condition is known as arthritis. This can be very painful or cause other problems, like lower back pain or even knee or hip pain. It is best to have this problem looked out. If you have a bump on the top of your big toe joint, our doctors can help to relieve your pain and prevent further problems.